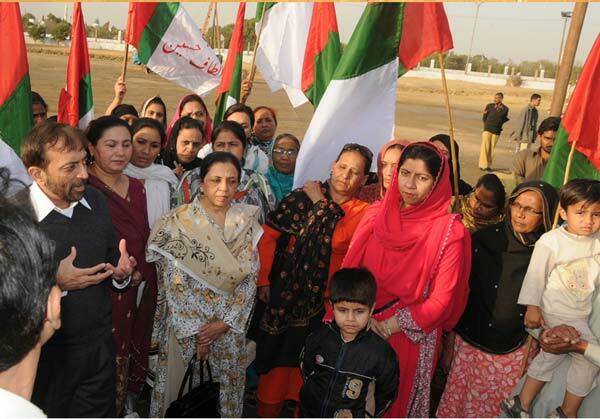 Chief of Muttahida Quami Movement (MQM) Mr Altaf Hussain has said that the public meeting being organized by the Women Wing of the MQM on 19th February in Bagh-e-Quaid-e-Azam would be the largest ever public meeting of the women. He said this while talking to the workers of the women wing who were busy in making preparations for the public meeting. A large number of other women were also present on the occasion. There was big zeal and fervour among the women when Mr Hussain called. They raised loud slogans to express their emotions and sentiments. Mr Hussain said that other parties had held large gatherings at the venue but the historic public meeting of the women on the 19th February would demolish all records and establish that even the women of the MQM were sufficient to take on the challenge posed by the opponents. Mr Hussain praised the women busy in their work and said wherever there was the flag of the MQM, there would be people having love for the humanity. He said that the women belonging to all faiths and nationalities would be present on the 19th February and demonstrate that they were firmly united despite diversity in their background. Mr Hussain asked the men to look after the household chores on the 19th February as the women would be busy in their work and attending the meeting at Bagh-e-Quaid-e-Azam. The women agreed with a loud cheer. Workers and office-bearers of the Women Wing of the MQM apprised Mr Hussain about the preparations and said that there was immense joy and fervour among the women in the city. Women were putting in their heart and soul for making the programme a big success. Mr Hussain commended Mrs Kishwar Zahra, in-charge central co-ordination committee of the women. He also praised the co-ordination committee, Karachi Tanzimi Committee, zones, sectors and units of the MQM for their untiring work.